Application modernization can seem daunting when applied to a large portfolio of applications, particularly when they run on older stacks and outdated hardware. But with the right approach, it’s possible to modernize them in a way that yields value quicker and at a lower cost. 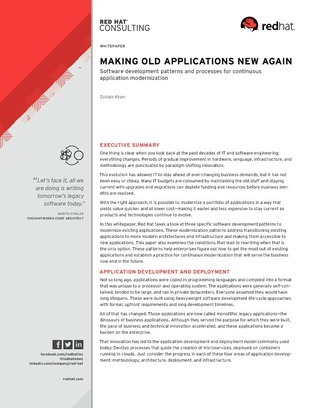 This white paper illustrates three specific software development patterns used to modernize existing apps—addressing the challenging transition of existing apps to new infrastructures. Read on to find out how to use these techniques to establish a practice for continuous modernization, to extend the life of existing apps, and to determine when it is necessary to rewrite from scratch, and more.